OpenFlow: is a key technology that enables software-defined networking by allowing the separation of data (packet forwarding) and control (routing decision) paths. Advanced classifier-based QoS: classifies traffic using multiple match criteria based on Layer 2, 3, and 4 information; applies QoS policies such as setting priority level and rate limit to selected traffic on a per-port or per-VLAN basis. Layer 4 prioritization: enables prioritization based on TCP/UDP port numbers. Traffic prioritization: allows real-time traffic classification into eight priority levels mapped to eight queues. Bandwidth shaping: Port-based rate limiting: provides per-port ingress-/egress-enforced increased bandwidth. Classifier-based rate limiting: uses an access control list (ACL) to enforce increased bandwidth for ingress traffic on each port. Reduced bandwidth: provides per-port, per-queue egress-based reduced bandwidth. Class of Service (CoS): sets the IEEE 802.1p priority tag based on IP address, IP Type of Service (ToS), Layer 3 protocol, TCP/UDP port number, source port, and DiffServ. Remote intelligent mirroring: mirrors selected ingress/egress traffic based on ACL, port, MAC address, or VLAN to a local or remote HP 8200 zl, 6600, 6200 yl, 5400 zl, or 3500 Switch located anywhere on the network. RMON, XRMON, and sFlow v5: provide advanced monitoring and reporting capabilities for statistics, history, alarms, and events. IEEE 802.1AB Link Layer Discovery Protocol (LLDP): advertises and receives management information from adjacent devices on a network, facilitating easy mapping by network management applications. Uni-Directional Link Detection (UDLD): monitors a cable between two switches and shuts down the ports on both ends if the cable is broken, turning the bidirectional link into a unidirectional one; this prevents network problems such as loops. 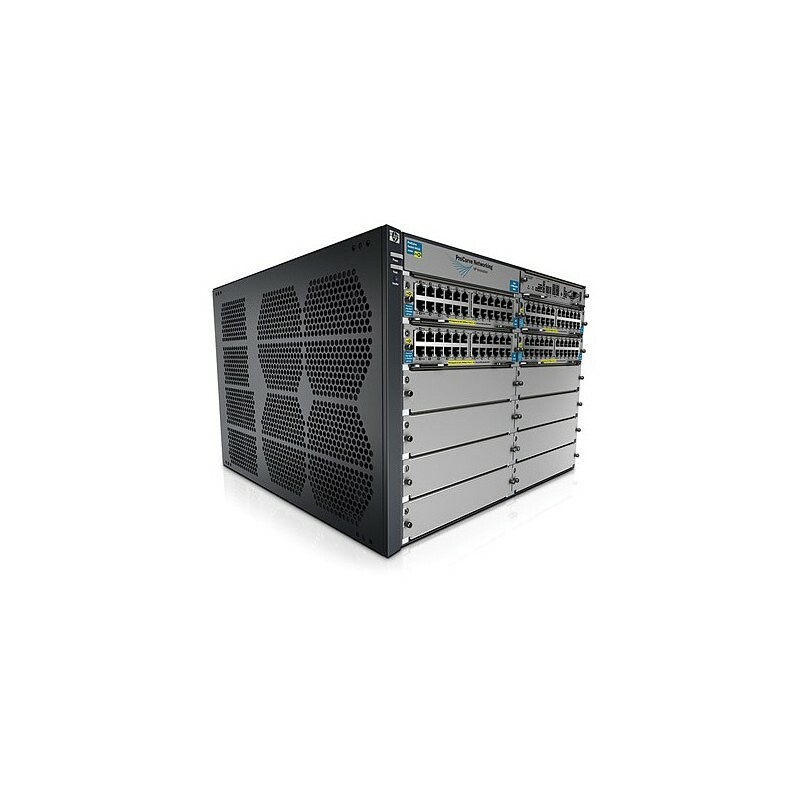 Management simplicity: provides common software features and CLI implementation across all HP ProVision-based switches (including the zl and yl switches). IEEE 802.3az Energy Efficient Ethernet: lowers power consumption in periods of low link usage (supported on v2 zl 10/100/1000 and 10/100 modules). IEEE 802.3af Power over Ethernet (PoE): provides up to 15.4 W per port to IEEE 802.3af-compliant PoE-powered devices such as IP phones, wireless access points, and security cameras. IEEE 802.3at Power over Ethernet Plus: provides up to 30 W per port to IEEE 802.3 for PoE- and PoE+-powered devices, such as video IP phones, IEEE 802.11n wireless access points, and advanced pan/zoom/tilt security cameras. High-speed, high-capacity architecture: 1 Tbps crossbar switching fabric provides intra-module and inter-module switching with 585.6 million pps throughput on the purpose-built ProVision ASICs. Selectable queue configurations: allows for increased performance by selecting the number of queues and associated memory buffering that best meet the requirements of the network applications. Virtual Router Redundancy Protocol: allows groups of two routers to dynamically back each other up to create highly available routed environments. IEEE 802.1s Multiple Spanning Tree Protocol: provides high link availability in multiple VLAN environments by allowing multiple spanning trees; encompasses IEEE 802.1D Spanning Tree Protocol and IEEE 802.1w Rapid Spanning Tree Protocol. 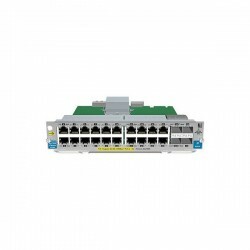 IEEE 802.3ad Link Aggregation Control Protocol (LACP) and HP port trunking: support up to 144 trunks, each with up to eight links (ports) per trunk. Distributed trunking: enables loop-free and redundant network topology without using Spanning Tree Protocol; allows a server or switch to connect to two switches using one logical trunk for redundancy and load sharing. Optional redundant power supply (HP 5400 series): provides uninterrupted power and allows hot-swapping of the redundant power supplies when installed. VLAN support and tagging: supports the IEEE 802.1Q standard and 2,048 VLANs simultaneously. IEEE 802.1v protocol VLANs: isolate select non-IPv4 protocols automatically into their own VLANs. GARP VLAN Registration Protocol: allows automatic learning and dynamic assignment of VLANs. IEEE 802.1ad Q-in-Q: increases the scalability of an Ethernet network by providing a hierarchical structure; connects multiple LANs on a high-speed campus or metro network. MAC-based VLAN: provides granular control and security; uses RADIUS to map a MAC address/user to specific VLANs (requires v2 modules).